Kaise WordPress Blog Par Cloudflare Free SSL / HTTPS Certificate Install Kare? Kya aapne abhi tak Cloudflare Free SSL / HTTPS Certificate blog par install nahi kiya? Google bina https vale blogs ki tulana men aapko blog ko priority dega. Jisse aapki traffic badha sakti hai. Visitors aur blog ke bich men trust badhega, jisse aap jyada sales kar apni income badha sakenge. Aaj hi mere dvara bataye steps ko follow karke ke cloudflare free SSL / HTTPS Certificate easily install kar sakte hai. SSL / HTTPS Certificate kya hota hai? SSL (Secure Socket Layer) ek web certificate hota hai, jisme aapka naam, domain name, company name, SSL expiry date hota hai. Jise ham HTTPS (Hyper Text Transfer Protocol Secure) ke naam se bhi janate hai. Yah visitor aur blog ke bich encrypted link create karta hai, jiske through securely data transfer hota hai. Is encrypted link men koi hackers tank-jhank nahi kar sakta. Cloudflare Ke SSL / HTTPS Certificate Kitane Types Ke Hote? Cloudflare tin type ke SSL certificate available karta hai. 1.Flexible SSL – Yeh certificate visitor aur cloudflare ke bich encrypted link create karta hai. Lekin aapke server aur cloudflare ke bich encrypted link create nahi karta hai. Jisse hacker cloudflare aur server ke bich ke protocol men tank – jhank kar sakta hai. 3.Full SSL (Strict) – Yeh Full SSL ki tarah hi encrypted link create karta hai. Par ise install karne ke liye server par authorized SSL certificate install karna padta hai. Full SSL Certificate me kisi certified authority ki sign nahi hoti hai, jabki Full SSL (Strict) Certificate me kisi certified authority ki sign jaruri hota hai. 1.Top bar me show ho rahe Crypto par click kare. 2.Ab SSL men Flexible option ko select kare. 1.Is plugin ki setting men jaye, iske liye wordpress ke left navigation me HTTPS par click karen. 2.Proxy ko auto karen. Fir save kar de. 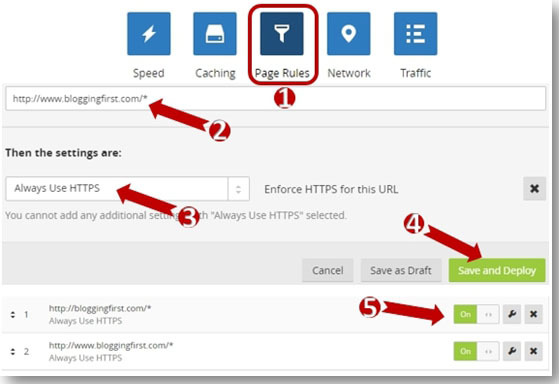 3.Cloudflare Flexible SSL Plugin me koi setting nahi karni hai. 2.Page rule par click karen. Yadi aapka domain www.yourdomain.com jaisa hai to ye do page rule create kare. dhyan de, domain se pahle http:// hi likhe. 1. Ab aap WP Dashboard> Setting> General Option me Jaye. 2.Wordpress Address (URL) aur Site Address (URL) ke http ko https me badal den. Ab aap apne blog ko refresh karen. Congrats aapke blog par Cloudflare Free SSL/ HTTPS Certificate install ho gaya hai. Hope, aapne successfully Cloudflare free SSL / HTTPS Certificate install kar liya hoga, yadi aap koi problem face karte hai to jarur share kare. its perfect post. bahut he badiya article likha hai apne thank you. ik bar hamare blog ko bhi visit jarur kare. Thanks and sure, I had visited your blog. aap sabhi browser me blog ko open kar check kare len. kya aapke blog URL ke aage Green Padlock show ho raha hai ? Bilkul, aap SSL setup kar sakte hai. Hi, thanks very much for this article. I came across your post last week and implemented the above steps on my blog but after two days of applying my flexible SSL certificate was still pending. I contacted their support and they explained the delay wasn’t from their own end. I later came across another article on Let’s Encrypt free SSL. I implemented the steps and it was like magic. The let’s encrypt SSL is active though will have to renew it every 3months. Make sure, let’s encrypt works well in opera. And I see high server response time. http://joxi.ru/a2XZNz3u15715r You should decrease it.